I just received my new watch and absolutely love it. It’s exactly what I wanted and is exceptionally comfortable with the rubber strap. As I mentioned previously, I have been an avid watch collector for over 30 years and at one time had over 25 watches in my collection including: Rolex, Breitling, Panerai, Audemars Piguet, Patek Phillipe and Breguet. I have sold all of them except my four UTS’s and a dress Patek Phillipe. There is no need to own any other watch and if I add any others to my collection, they will be UTS’s. Thanks for exceptional watches and phenomenal customer service, I will be a customer for life. I have been collecting watches for well over 20 years and through this I have learned never to buy a watch sight unseen. This watch truly lives up to and exceeds every positive review I have read, and the advice, help and customer service provided by Stephen is truly world class We spoke for the first time last Tuesday again on Wednesday I ordered the watch on Friday afternoon and had it in Canada on Monday morning I opened the watch at the Fedex depot and instantly had 4 guys around it taking pictures. So exited to receive my 1000m V2 today. It is everything that they said it was and more. Just beautiful and looks even better than the photos! And as for the customer service -- quite simply amazing! Stephen is so responsive to questions and great to work with. I am based in Vancouver, BC. I ordered the watch on Wed evening, and it was here Friday lunchtime! Amazing. I would like to preface my comments about my watch with a few words about Stephen. He is a consummate professional, attentive to the needs of the customer, and helped me put a UTS 1000M V2 on my wrist in two days! He steered me in the right direction concerning my budget and what I wanted out of a good diving watch. 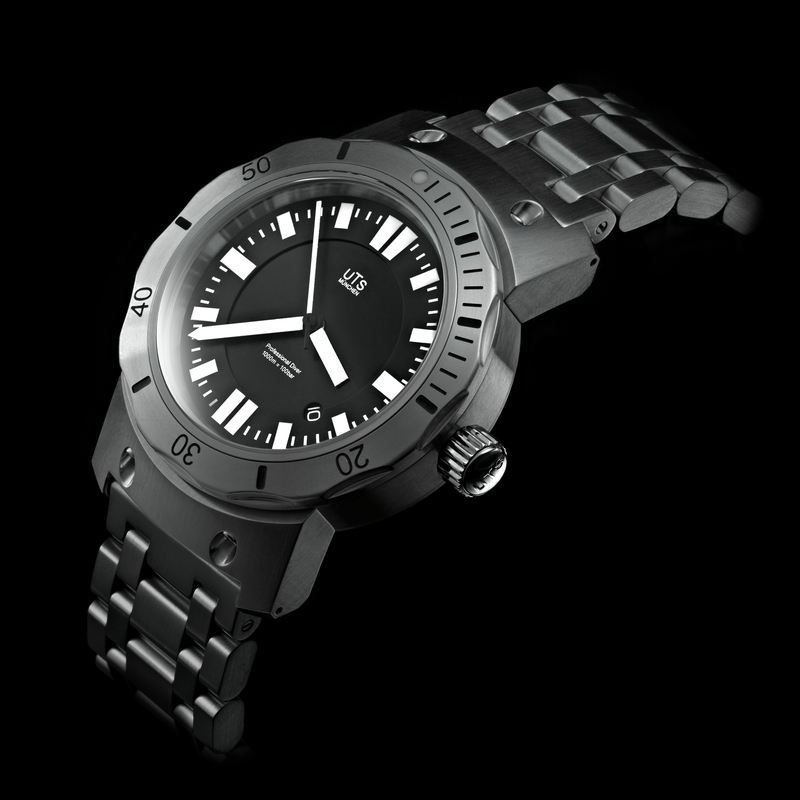 The watch I chose was the UTS 1000M V2. The pictures are well done on this site but they cannot prepare you for seeing the watch in your hands. 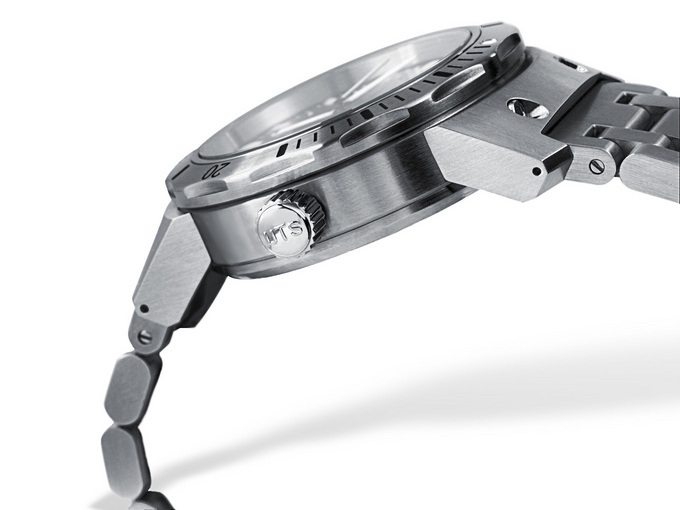 The design, craftsmanship, precision and comfort of this watch speaks volumes about Herr. Spinner and his work. The black Italian rubber strap, which I chose, is well made and very comfortable to wear. I like the clean look of this watch, the subtle idea of form and function. 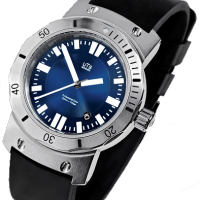 After checking other watches and their prices UTS watches stood out for their dedication to excellence and a very reasonable price point! 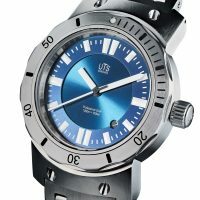 If you are in the market for a watch that is unique, made to the highest standards, and you want first class customer service - take the time and contact Stephen - have him put a UTS watch on your wrist. First, I would like to say Thank you to Stephen, for the pleasant experience I have had with him of purchasing my new watch. From the first initial contact via email and than over the phone, Stephen answered all of my questions and with his professional and sincere approach, he helped me to decide on the UTS 1000M V2 with black dial. Initially I was going to purchase the Adventure automatic, but something was telling me to go for the 1000M V2 and I am glad I did. What a watch! I am by no means a watch enthusiast nor I know much about watches, but I just wanted to treat myself for the first time in my life to a really nice and unique, in my own world, expensive watch. 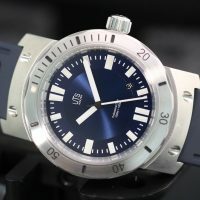 I was considering buying new Omega dive watch, even used Rolex (can't afford new one), but being a big fan of German engineering and made in Germany products, I came across UTS brand and I was sold. The craftsmanship, the look, feel and attention to details is plainly superb, as is expected. 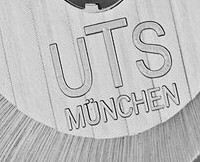 UTS is certainly unique brand and by not being a mass producer as most of other high end brands, this to me is even more special. Thank you Herr Spinner and thank you Stephen. I live near the ocean in Hawaii and own a number of dive watches: Rolex submariner 50th anniversary, AP Royal Oak Diver, Breitling Superocean (which is going on 5 months for a service! ), and I am really impressed with the 1000M V2. I got #/200 of the blue dial and crystal back (which is rare for a 100bar depth watch and makes it unique amongst other dive watches of that depth). It wears very well (I'm using the SS bracelet), and I really like the proportions. I am sure I will get another before long. I really like the limited quantities and can't wait to see what Mr. Spinner comes up with next. As the other reviewers have already said the quality of the construction, finish and design is absolutely top notch! In addition to being more distinctive in design compared to more pedestrian dive watches whose brands I won't mention, it is just plain cool to wear a watch that practically no one else has! The bang for the buck is unbelieveable! And the watch is just plain badass! 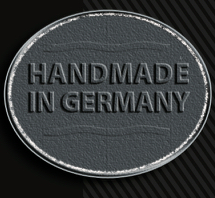 Handmade, german, unique, what more could you ask for? I have worn my Rolex submariner for over 10 years and recently desired something new. 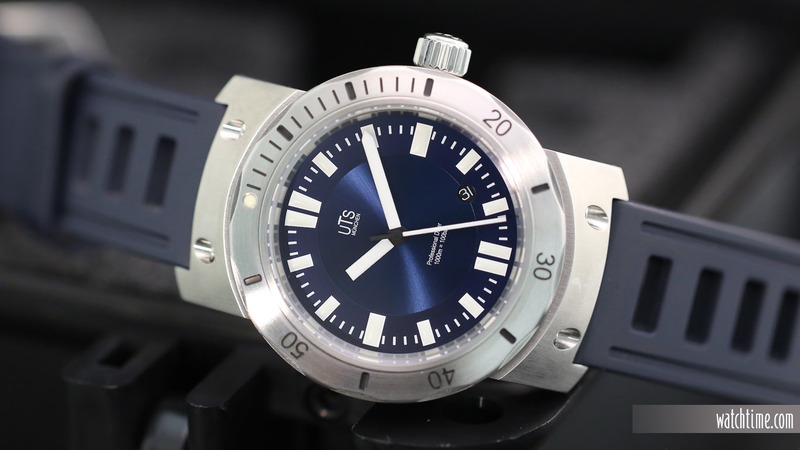 I stumbled on the UTS Divers watches and I am glad that I did. 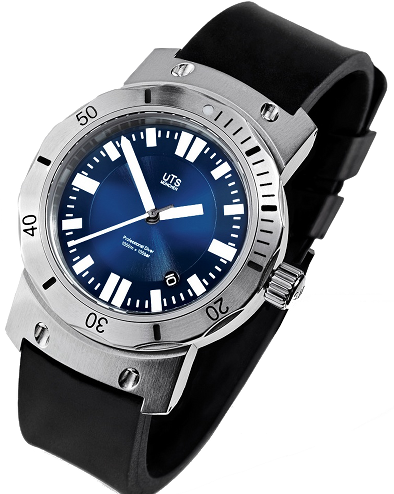 The UTS 1000M professional divers watch is just fantastic. It is just as accurate as my Rolex, actually more so. But the look is phenomenal, I could not be more please. And the service from Stephen at UTS was second to none. I'm astounded by the quality of this watch. I love the deep black dial, the luminous hands, the bezel. The case is just something else really unlike any watch I have ever owned before. The brushed finish is fantastic! 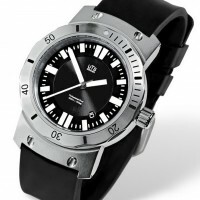 I recommend the UTS Diver 1000M it is a Fantastic dive watch! If your a collector you make some mistakes along the way and come to know when you are really holding a fine time piece. 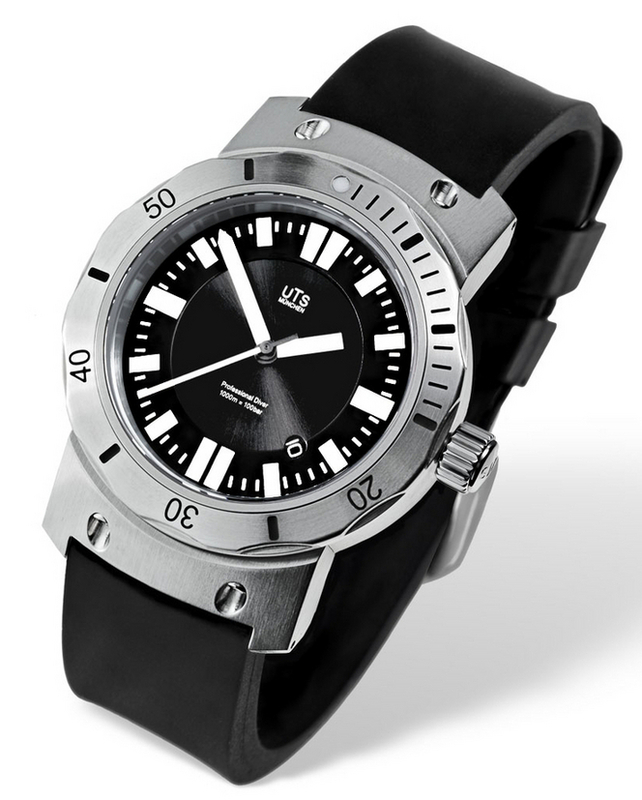 I'm struck really by how something so simply conceived in design clearly radiates such exceptional styling and really defines a seperate, unique execution of a dive watch which tend to look, after awhile, very similar. First. The case lugs are a hot styling difference and my just shy of 7 in wrist fits very comfortably. Second. The blue dial color, with its stepped design and sunray dial center contrasts with the different finish border beautifully. Third. 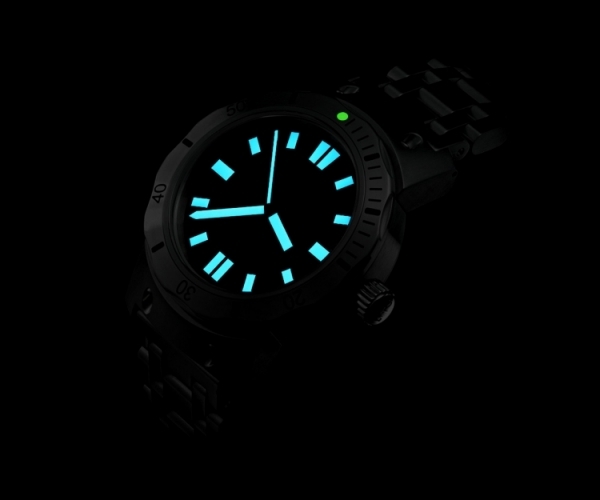 The lume is very bright. And the indexes at the hour markers dome up a bit because they have so much lume. Fourth. I really like the way the seconds hand and minute hand go to the end of the indexes, a cool contrast to the hour hand which stays in the sunray dial area for contrast. Fifth. The bracelet locking mechanism is the best I've ever owned, with a unique sliding mechanism for a wet suit. Sixth, but should be first... Stephen is completely professional, concerned about the quality of the product and not forceful nor assertive for the purchase. Rather he guides you through an understanding of the product , which is of course limited to 200 and fewer for the blue dial. Anyone, in any time period would value this piece so it will be enjoyed for many years to come. Fantastic quality and service from UTS. I'm very pleased with my new UTS Divers watch 1000M. The watch arrived with the bracelet perfectly sized and the time set on the second! I'm already saving for my next UTS! I bought this watch a year ago since I was looking for a rugged diver. 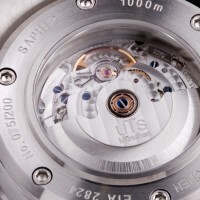 I looked at many models including Sinn, GP, Muhle-Glassutte, etc. 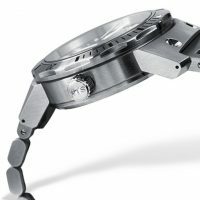 I found UTS via a watch forum that I frequent. I took a gamble and ordered the watch without trying it on first. Well, I gotta say, I love this watch. It is very elegant in design but also very comfortable. Of all the watches in my collection it gets the most wrist time. I wear the watch almost exclusively on the rubber strap (and I even found a Panerai style deployant for it), since the SS bracelet, in my opinion, detracts too much from the great lug design. That said, the SS bracelet is very very nice. In terms of customer service, price, design, comfort, and dependability, I can't say enough good things about this watch and UTS in general. 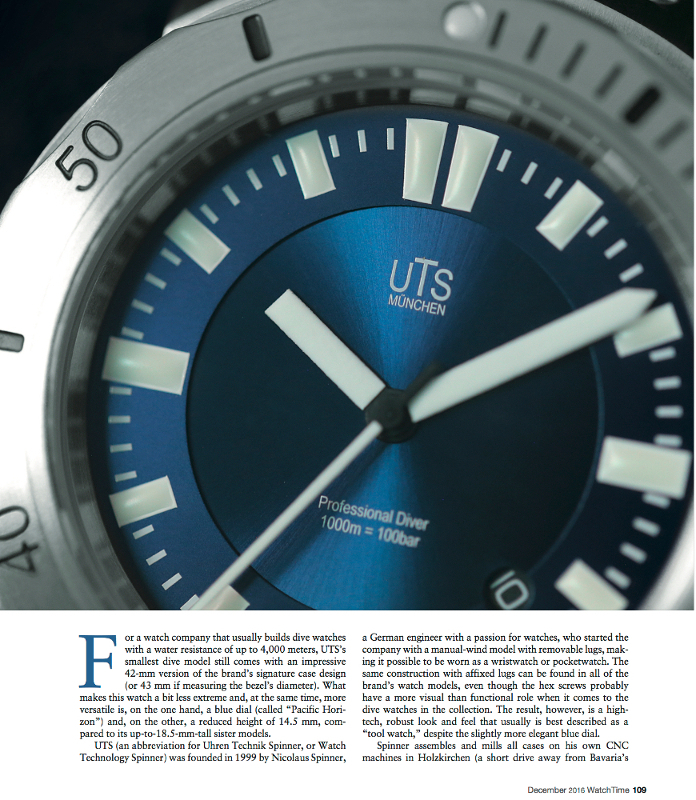 If you're considering a new dive watch, take a look at UTS. I have wanted a UTS watch for quite some time. After seeing the 1000m watch in a review in Watchtime magazine a few years back. For me this was a grail watch purchase. It has exceeded my expectations, and then some. The brush finish on the steel and the curves of the case you simply cannot see in photos. It is a gorgeous and masculine work of art. Add to this the personal level of service the owner of the company provides and it is an unbeatable product. I'm very pleased with my UTS Divers watch. I ordered mine with an optional sapphire display back. Amazing watch! To have a sapphire display back on a 1000M rated watch is just unheard of. I was worried about the size but this watch fits my wrist perfect and is fantastic to look at. 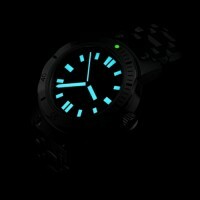 I highly recommend the UTS Divers watch. Another awesome watch from UTS! I already reviewed my other UTS, the 3000M - long story short, flawless fit and finish and a customer support that's hard to beat. My 1000M V2 story follows the same path - kind and quick answers from Stephen, watch coming into a Pelikan hard case with the steel bracelet already sized and time and date set. The watch is once again flawless executed - kind of the 3000M little and maybe classier brother: it's still a brutal chunk of steel and sapphire (and yet rests so well on your wrist) but not so overbuilt; the "two-tone" dial is a thing of beauty and it is really bright in the dark - easily lasts several hours. How to choose between the two? Tough call! But whatever you'll choose, the difference will only be in the look: quality and customer support will be at the typical UTS top. Love this watch! I put on a watch when I buy it, it come's off when I break it! This watch fits me just right, no nonsense gismo's or doo daad's. Time and date all you need! From Iraq to Africa, from sand to snow this watch is great! I beat the hell out of it everyday and it ask for more! Exited a chopper today and slamed the watch by accident against door frame. I thought it was broke for sure, but just another scratch! Thank's Stephen! I owned the UTS 1000M V1, got one when it first came out in fact a few years ago. It was my favorite watch and I wore it everyday for 3 years. A perfect watch could it get better?. Then the V2 came out this year and it is everything I loved about the V1 and then MORE. It has a larger dial (and what a dial it i!) The deep black color and recessed sub-dial is very "art-deco" a stunning look. The new bezel is perfect, and I could not be happier. 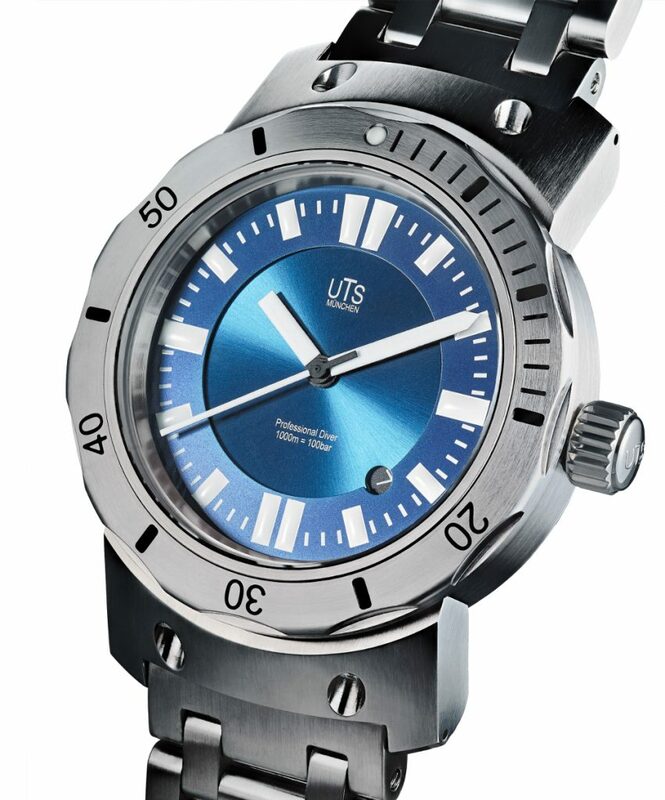 The UTS 1000M is a perfect watch it is not too big like a lot of 1000M diver watches on the market seem to be. I love the size it fit's my 6.5" wrist like a glove. 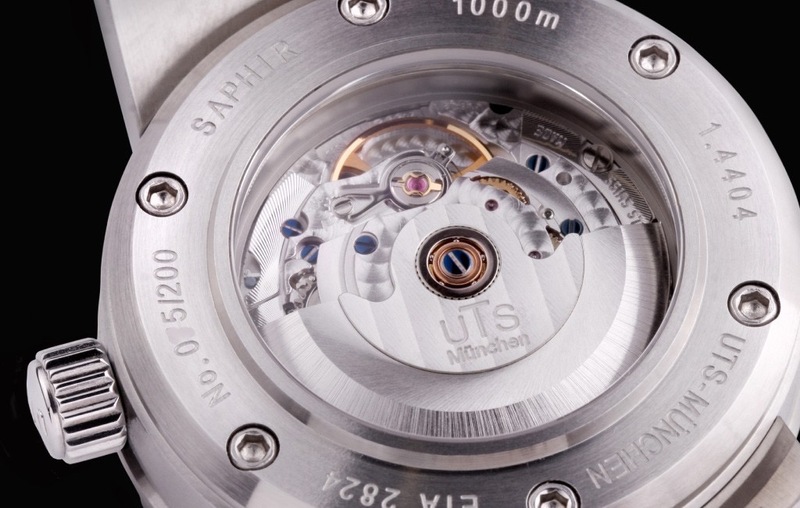 Service from Stephen Newman at UTS Watches could not be better either! internet. 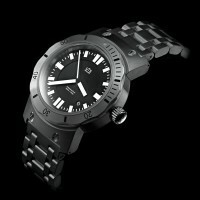 After researching the matter very carefully, I bought a black-faced U1000m divers watch I simply love it. interest in them. This may sound sentimental, but so what? That coincidence was only the beginning. 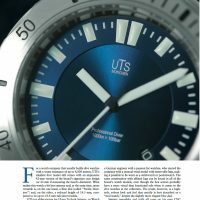 My research confirmed the quality and value of UTS watches. Must one be a professional diver to appreciate this particular watch? I think not (but it helps if one can at least tell the time). should help ever be needed beyond that covered by the warranty. already highly praised brand got me a difficult task to choose one. I decided on the 1000M Diver with limited edition black dial. When I talked to Stephen, he was very pleasant and accommodating. After much discussion he got me my 1000M Diver. The watch arrived very quickly and I was immediately happy. The weight of the watch is substantial yet comfortable. The bracelet was already adjusted perfectly to my wrist size as Stephen asked me during my ordering. I have this watch on my wrist daily since I got it a few months ago. A totally satisfying experience with Stephen and absolutely amazing watch. I already had comments for it. Thanks Stephen.